The iPhone 5 has officially gone on sale with eager beaver Apple fans now able to fondle their new handsets to their hearts' content. As well as pre-order deliveries slowly trickling out to the populous, the usual queues were out in force this morning. The first people in line at the Regent Street Apple Store had queued for a week without even being in it for the tech; instead they were raising awareness of the plight of vulnerable women and planning to flog the phones on eBay. Other characters hanging around for days on end to buy a phone they could have just pre-ordered included a man wearing a full lycra body suit (uh-huh) and the now-familiar tech queue expert Zohaib Ali, who also nabbed the first PS Vita when it went on sale back in February. These eager iPhone fans weren't deterred by the troubles Apple has encountered with its iOS 6 Maps app. No one but no one is impressed with the Apple-made Google Maps replacement, as spelling errors, geographically questionable locations and catastrophic post-apocalyptic satellite imagery abound. 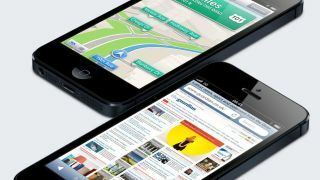 Apple's requested we cut it a bit of slack while it tries to sort out the app's "kinks", but new iPhone 5 owners may want to take a road atlas out with them for the forseeable just to be on the safe side.